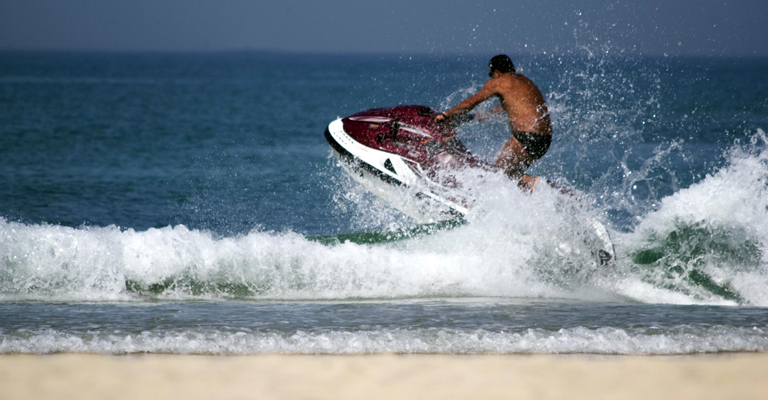 A person must not operate a recreational vessel (including PWCs) or hire and drive vessel at a speed or in a manner which is dangerous to the public, birds and marine animals. A member of the police force may exercise the power to seize, impound or immobilise a vessel, if he or she believes on reasonable grounds that a recreational vessel is being or has been used in the commission of a relevant offence. In addition, Victoria Police and Maritime Safety Victoria have the power to embargo and prohibit the use and operation of a vessel. Hoon boating is any dangerous behaviour on the water that may potentially cause someone to get hurt. 'a person must not operate a vessel at a speed or in a manner which is dangerous to the public, having regard to all the circumstances of the case'. This 'dangerous operating' offence was chosen as the trigger for the hoon laws because it involves the danger of death or injury. Endangering water skiers by going too close to jump their wake. Behaviour that does not meet the legal threshold of 'dangerous operating', is covered by other provisions in the Marine Safety Act 2010 (Vic). For example, 'masters of recreational vessels must take 'reasonable care' for his or her own safety and the safety of others (section 31). The laws empower Victoria Police and other authorised persons to issue an embargo notice and affix it to the vessel. An embargo notice prohibits the use of a vessel for up to 48 hours. It allows the owner or operator to take the vessel home, wash it and store it as normal. The notice states the period for which the vessel cannot be operated. It is an offence to operate the vessel during that period and the notice can only be removed by a member of the police or an authorised person. The embargo notice and sticker is comparable to the vehicle defect notice and defective vehicle label in the road laws. As an alternative to embargoing a vessel, police and authorised persons are empowered to order an individual off the water for up to 24 hours. The laws also empower Victoria Police to impound, immobilise or seize a vessel or have a vessel forfeited. The option of serving a notice of surrender on the owner or registered person, allowing 10 days to prepare the vessel for safe storage and transport it to the place of storage. A decision to impound a vessel will be subject to senior police review, providing a safeguard, consistent with the road hoon scheme, to prevent abuse of these serious sanctions. Other checks and balances are also provided, including the right to apply to a Magistrates Court on the grounds of hardship. For second and subsequent offences, the Chief Commissioner of Police will be empowered to seek court orders for impoundment for up to three months or forfeiture.